Some pirate games are quite complicated – not only do you sail, but you also have to worry about swordfighting, minding your investments, replacing your old lame clothes with new, more piratey clothes, and so on. Not so with Buccaneer: The Pursuit of Infamy. This arcade style is quick and to the point – take your ship out, blow apart the enemy, and collect your reward. It’s a refreshingly simple concept that when combined with stellar graphics and rousingly piratey sound effects (not to mention music provided by Swashbuckle!) makes for a fine way to kill your real-world productivity. 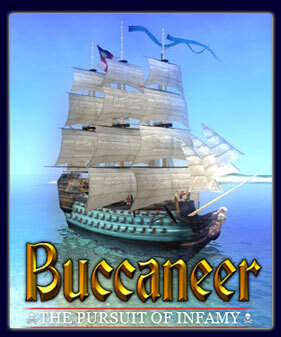 The format of Buccaneer is mission-based, in which you are given a goal (generally involving sinking enemy ships, destroying towns, or occasionally rescuing shipwrecked or captured pirates) – the faster you complete the goal, the higher your endgame infamy, and therefore the higher your final score. Ship controls are easily mastered, and fit closely with the standard w-a-s-d controls used in many other games. My only two complaints were that you have to continually hold down the “w” key to continue going forward, and that in telescope mode you can only look directly ahead (really, what kind of crow’s nest sailor doesn’t bother to sweep the horizon???) These factors aside, game control was indeed very natural. Cannon-fire, however, does take a bit of practice, as I initially felt they were actually firing just a bit backwards of the ship, but this might be due to the forward motion of the ships while in combat. Much of the campaign format is exactly as you’d expect from an arcade-style pirate game – as you progress and missions become more difficult, you can purchase newer, tougher ships, as well as upgrade your existing boat. What you can’t do, however, is collect ships – the purchase of a new one automatically replaces your old. With many games this would be problematic, but with Buccaneer there’s not much need to pick the right ship (faster vs. stronger, etc.) for the right mission – in my campaign I pretty much stuck with the best balance of speed vs. firepower in each class, and this saw me through well enough. All in all, Buccaneer makes for a very decent game – so long as you remember to hold it to arcade-style standards. With most all pirate games having some sort of shore-based element, virtual human interaction (chats with governors’ daughters and such), and open-ended game-play, Buccaneer’s rather linear, strictly ship-based format can at times feel limiting. But it’s still a whole lot of fun, and being as Buccaneer also has a multi-player element the opportunity to battle your mates online makes for an intriguing bonus. This entry was posted in Games and tagged arcade, buccaneer, stickman studios by Bilgemunky. Bookmark the permalink.